Acceptance to A Better Future. Yesterday in my article Peacemaker to Positivity I mentioned accepting the events of your life in order to be at peace with yourself and to use those events to help others who experience similar things. That’s a lot to ask of someone. There are events in this world that are difficult to accept. But you are either accept them or ALLOW them to run and ruin your life. And events are events. They are moments in time. Moments that have already happened and cannot be changed. We all go through the “If only I had…” moments. Those are the “I am holding myself back” moments. If you are a parent you try and do things through you child you wish you had done. As a spouse you want to be more perfect than whatever your parents were. We are going to fail in both of those. Our children are not us, so whatever they do is for them, not us. And our parents were them and not us. No matter what others do, it is them that do it. By accepting and moving on we can become a success at something on our own, for our own. We can help other people. I know there are those moments that are truly horrible, but what can you do about them? Don’t ALLOW them to turn you into something you aren’t. Don’t ALLOW anyone to win over your life but you. On Monday I wrote an article titled Let a moment just be a moment and as a result of comments I began thinking a little bit. No comments from the usual suspects please about me thinking. Emotional reactions and assignment of labels to events are habits. That can be good or bad or if you would rather you can call them beneficial or non-beneficial, as I often look at them that way myself. Some ‘good’ habits may not be beneficial or necessary. Recognition that you have these habits, either in a good or bad way, is a great benefit to you. Knowing you have created habits through the years, and if you examine your life you will likely see where certain habitual reactions began, you can either work to continue on a positive path to increase those beneficial reactions or work to decrease those negative ones that cause harmful effects on your life. Here’s the deal, yes, pretty much all of our lives are habits. Every aspect of our lives involves habits, other than the biological process such as breathing and the like. And even with breathing you can create a habit or routine manner of breathing in situations. Think about that one for a moment. If you think when someone talks about your Momma you have to hit them or insult them back, then you’ve got a habit going on and you’ve also ALLOWED that person to own you for a time. They got you. They know your sore points, your weaknesses. Just like in boxing when fighters prepare for an opponent they are training to how that opponent fights. They know what their opponent’s favorite moves are. If you don’t have habits then you can’t be owned as easily, including not being owned by your own weak mindedness. Overcome your negative view of not being able to control your habitual reactions and thoughts through creating healthier habits of positivity. A way to begin is by looking at that List of Negatives I asked everyone to create a few weeks ago and think about how they became negatives. Examining and understanding your emotions and thought processes is one of the key factors of creating a positive you. A positive you is not just for you alone, it’s for all those who associate with you. Everyone you know will benefit from a more positive you. 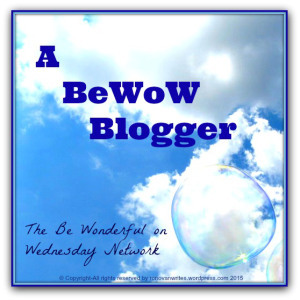 An Awesome post written for #BeWoW. Well, I think it was written for far more than that but it happened to coincide with it. I know she worked on this a few days and it came out great. A definite MUST READ for everyone. Seriously. Don’t miss this one.